A number of Aussie tangueros/as had organised our Saturday night - which was just perfect. Originally we had planned to go to Los Consagradas - but it was closed - so the new agenda was Plaza Bohemia in Maipu until about 9.30 then Club Bohemios in La Boca. Plaza Bohemia (see picture early in the night) I found a soul-less. I will certainly give it another try, but it lacked ambience and I felt sorry for the women sitting like birds waiting to migrate along one wall... I know there are those who think I am a heretic when I say that I think using the cabaceo in this old-fashioned way is not conducive to a good night out (for me anyway). 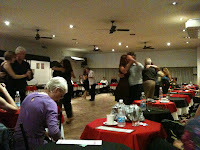 About 14 of us then went on to Club Bohemios. 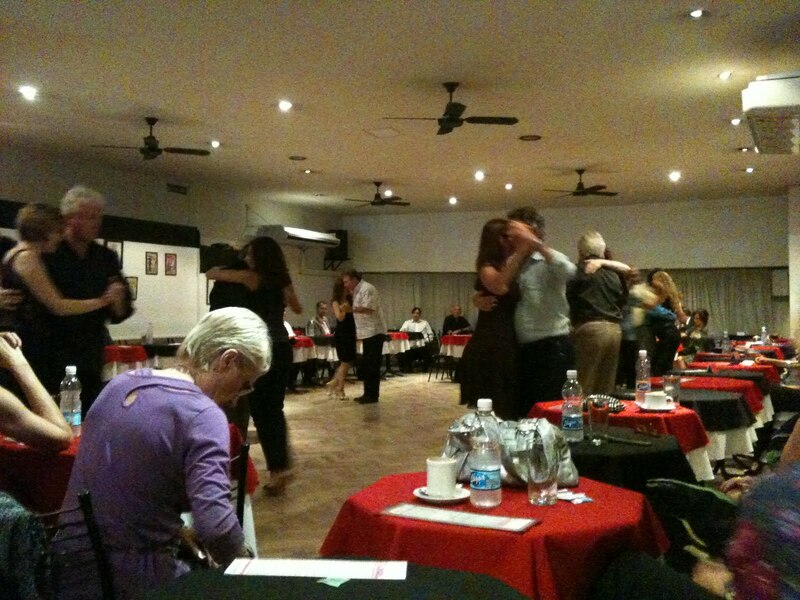 An old-style milonga in an insalubrious area, it is run by a friendly couple who were so delighted to have a table of Aussies they gave us all a present. It was fun to catch up with friends we hadn't seen for a while as we enjoyed the asado we shared for the mighty sum of 25 pesos! each including wine, potatoes and salad! And it was good food. Those who had arrived that day were ready for their chariot at midnight so we organised three taxis and left just after midnight! It was a great night!